Samsung and KDDI together ran a successful multi-device test of next-gen 5G connectivity, using prototype tablets supporting the faster network. The test was conducted at Okinawa Cellular Stadium, a ballpark with capacity for 30,000 fans, and the results were announced today. This was the first trial in Japan to test 5G connectivity using 5G tablets. A 4K live video feed was downloaded and streamed simultaneously on these 5G slates using the millimeter wave spectrum. Equipped with beam-forming technology, Samsung placed 5G access units on the light tower just beyond the left field fence. This provided the seats by home plate, and by first and third base, with 5G coverage. Tablets placed on seats located in those areas were able to stream the aforementioned 4K live video feed over 5G. 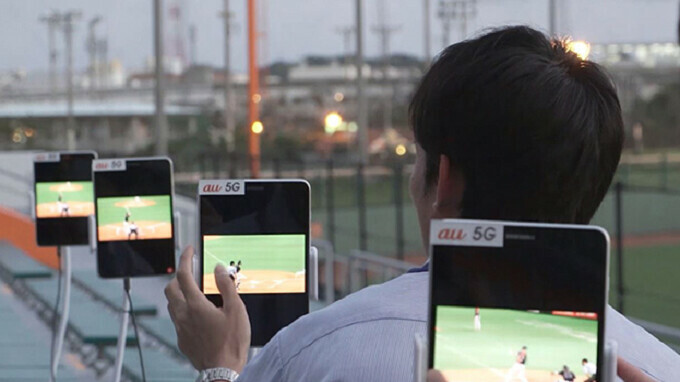 The Samsung/KDDI team employed 5G technology using the ultra-high 28GHz spectrum band to show that 5G connectivity can be accessed by a large number of mobile device users inside a stadium, or at music concerts, trade shows and conferences. Samsung says that this test will give 5G "momentum" as it approaches the commercialization stage.